- D 2000-002 : "The Three Caballeros Ride Again", from 2000, by Don Rosa. Guy Williams, whose real name was Armando Catalano, was born on January 14, 1924 in New York. After school, he worked as a male model and came to the attention of MGM and then Universal-International Studios, who put him under contract in 1952. Although he appeared in films such as Bonzo Goes to College, Mississippi Gambler, Seven Angry Men, Sincerely Yours, I Was A Teenage Werewolf, The Last Frontier and Man From the Alamo, Williams' parts were relatively small and it looked like his hopes of becoming a leading man were in vain. By the time Disney found the 6'3" actor, Williams was almost ready to give up his acting career. Luckily for Williams, he was auditioned for the role of Zorro / Don Diego de la Vega, and to his astonishment, he found himself the star of the network series. 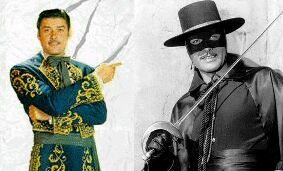 In this series, which started in 1957, Don Diego de la Vega opposes the corrupt tyrants of Spanish California as the masked swordsman, Zorro. Throughout his exploits, Diego could always count on the assistance of his faithful manservant, Bernardo. After the last of the anthology Zorro episodes had aired, Walt lost interest in the character, and in 1967, the Studio decided not to renew its option and let the rights revert to the Gertz estate. With the syndicated run over, Zorro became just another canceled television series. The Studio decided not to renew Williams' contract. After he left the Disney payroll, Williams worked in a number of film and television roles. It was there that Guy Williams died alone, on 7 May 1989, from brain aneurysm.